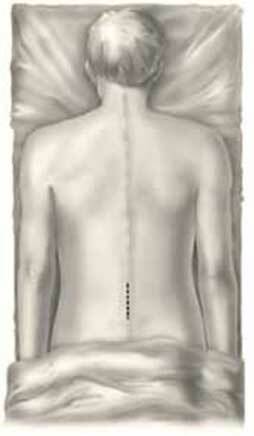 This illustration demonstrates the incision that is used for a microdiscectomy. Many specialists use an incision that is only about one third as long as the incision on the illustration. The length of the cut is of little consequence. Microdiscectomy is a relatively minor invasive procedure with the minimum amount of tissue damage. The illustration above (top left) demonstrates the area through which the spinal canal is entered (circles), by taking a small amount of the lamina (see the section Anatomy of the Spine) and removing the ligament inside the spinal canal (ligamentum flavum). The picture next to it reveals the nerves after the bit of the lamina and the ligamentum flavum has been removed. This image demonstrates the approach when both sides are done at the same time. Only one side would frequently be performed, especially if the disc herniation is only towards one side. The bottom two pictures demonstrate how the nerves are retracted to one side and the offending part of the disc removed. 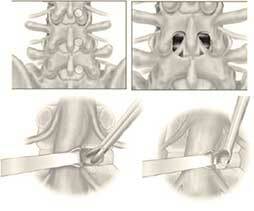 A lumbar microdiscectomy is performed for a slipped (herniated or prolapsed) disc. The aim of the operation is to remove the bit of the nucleus pulposus (see the sections Your Back Operation and Anatomy of the Spine) that has herniated through the annulus fibrosus. It is important to realise that the remainder of the nucleus pulposus will remain behind and can eventually also herniate and cause repeated symptoms. This is one of the complications following microdiscectomy and the recurrence may be as high as 20%-50%. The reason why your specialist performs this procedure and not a more invasive operation is because he or she is trying to be as conservative as possible in doing your surgery. Hopefully these damaged discs might heal in time and not result into a more invasive operation. Some progress in the less invasive surgery front has been made by laser surgery, endoscopic surgery and percutaneous Nucleoplasty. When undergoing this operation, you will be lying on your stomach on bolsters or pillows. Your specialist will make a small cut along your spinous processes. This cut can vary from two or three centimetres to a slightly larger cut. Sometimes the cut is performed to the side of the spine to allow for an approach from the side through the muscles. The length of the incision depends on various factors such as patient size, the number of spinal levels involved and your specialist’s preference. The length of the incision is actually of little consequence with regard to the success of the operation. The soft tissue and muscles that are attached to the vertebrae are stripped away by a combination of electrosurgical cautery (a blade that cuts with an electrical current) and dissecting instruments. A small amount of bone as big as the nail on your little finger or slightly more is removed along with some ligaments. This allows direct access to the nerves. They are retracted and the disc fragment is removed. Thereafter the wound is stitched up. You would be expected to get out of bed quite soon and usually on the first day following surgery or even on the same day. You may usually walk around as much as you want, but you should take care and not sit for too long or on a seat that is very low. This is to prevent you from having a repeat disc prolapse (herniation). Most specialists recommend a duration of 30 minutes or less of sitting at a time. It is best to sit on a chair that is at the height of a barstool. You would normally be discharged at about one to three days after surgery, depending on the degree of pain and disability you are experiencing and on the absence of any complicating wound factors or concern about your general health at the time. It is incredibly important to get a lot of rest and exercise following your surgery. Do not try to rush back to work. It is important to walk for exercise and also exercise in conjunction with the guidelines from your physiotherapist. You may perform activities only as prescribed by your specialist. You should refrain from exercises that involve impact for at least three months. This would include jogging, mountain biking and equestrian pursuits.